Wow!! 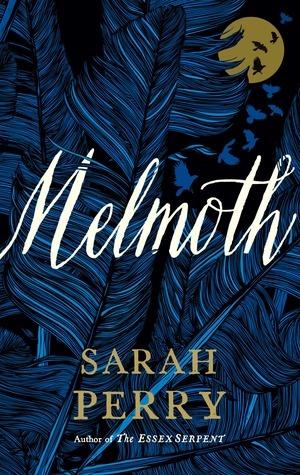 Since loving The Essex Serpent, I've been eagerly anticipating the release of Melmoth, so the moment I got my hands on a copy I just had to start reading it and it has exceeded my expectations!! In some ways I found it more captivating at times than TES, as it's a much less complex tale and just allows the reader to focus on the legend of Melmoth through a series of documents, and from those who are going through their own dark times. Do you ever have that feeling that you're being watched? Well if you don't, you will do after reading this book! I will never look at an empty chair left in a random place the same again, and if I smell the scent of lilies out of nowhere ..... eeekk!! Set in Prague, we follow the story of Helen Franklin. Something is haunting her and she seems to live each day to punish herself for whatever happened in the past. She lives a very basic life, often denying herself food,avoiding social contact, has very few possessions and doesn't even like to hear music. No matter what is around her, she seems to find the world a very ugly place. Her childhood was quite regimented, parents didn't like to draw attention to themselves and she always had that feeling that she was being watched, even though there was never anyone there. Her time in Prague had led her to become friends with Karel who she met in a cafe, and when he insists she reads some documents he found she just can't understand his complete obsession with the character of 'Melmoth' that he has read so much about. It almost drives him to insanity - the more she starts to read, the more she begins to understand the pull of this dark creature that has been around for so many centuries. Melmoth is said to hide alone in the shadows, ready to search out those who are most distressed and wicked, and through the documents found we get to see a number of stories of people and their connection with Melmoth. The dark times that drove Melmoth to seek them out and the legend that followed her around through stories told to children. This book is told in 3 parts and each part has the perfect level of story building. Your interest is engaged throughout as new facts are drip fed to you of the past, alongside Helen and her struggles to free herself from the past that just won't let her go. When she goes to dinner with her neighbour and 2 friends, their confessions of sins is a staggering read and beautifully told. It explores the overwhelming wickedness of humanity in an astonishing way. The story of Josef was definitely the most revealing and horrifyingly captivating - why do people do the things they do? What's the right thing to do as a human when you're faced with stark choices and a conflicted mind? I was completely mesmerized by the whole story and it is definitely one of my favourite books of 2018. Go read it!! !